Mangalore, Sep 16, 2014: Amid private bus operators’ opposition to its entry, the Karnataka State Road Transport Corporation (KSRTC) is gearing up to operate city buses in Mangalore, Udupi and Shimoga with funding from the Jawaharlal Nehru National Urban Renewal Mission (JNNURM). The corporation has sought permission to operate 35 buses each from the Regional Transport Authorities (RTAs) of Dakshina Kannada and Udupi for Mangalore and Udupi cities while the Shimoga RTA had already granted permits to operate 65 buses in Shimoga town and 35 in adjacent Bhadravathi town. 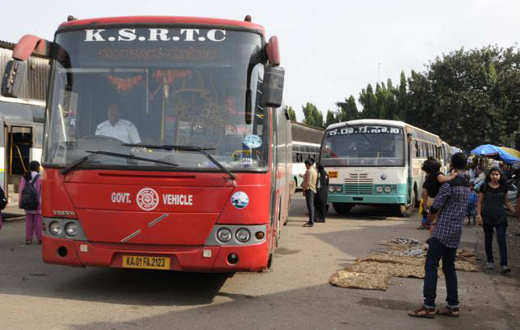 KSRTC’s repeated attempts to penetrate the private bus-dominated markets in southern Karnataka were being opposed by private operators, primarily before the RTAs whenever the corporation’s applications came up for consideration. Upping their ante further, the operators wrote to the Union Ministry of Urban Development that regulates JNNURM scheme in January this year, not to release funds to KSRTC to run city buses in the three cities. The DK Bus Operators’ Association in its letter said the JNNURM funding was applicable only where organised transport system was absent whereas cities of Mangalore and Udupi had the city bus system since pre-independence days. The association further argued that Deputy Commissioners of Dakshina Kannada and Udupi districts had prohibited issue of fresh permits through District Magistrate (DM) notifications for buses to enter central parts of the respective cities in 1993 and 1994, owing to the increased number of vehicles. However, the KSRTC took strong objections to this letter and argued that private operators were attempting to create monopoly on the roads; they had no right to object the corporation’s entry. The DM notifications applied to stage carriages (private buses) and not KSRTC, which is governed by the route nationalisation scheme under the Motor Vehicles Act, it said. Private operators then made another fresh attempt by approaching the Karnataka High Court seeking restrictions to issue fresh permits to KSRTC for the cities of Mangalore, Udupi and Shimoga. The court, however, turned down their plea in April this year and said it could not issue blanket directions to the RTAs and asked the private operators to raise their objections before the respective RTA. The State government on August 1 wrote to the Ministry of Urban Development to release the first instalment of funds under JNNURM for the city services scheme. Funds are expected shortly, said a senior KSRTC official.